The Indian Cricket League (ICL), Zee Entertainment head Subhash Chandra’s rebellious newborn was finally on its feet this evening. To see the BCCI’s potential challenger roll with its first Twenty-20 tournament at Tau Devi Lal Cricket Stadium here was a packed house, a battery of political bigwigs and stunner Kareena Kapoor. After going through the Twenty20 World Cup matches, one expected the inaugural match of the ICL tournament to be reasonably high-scoring affair. The match between Chandigarh Lions and Delhi Jets in progress at the Tau Devi Lal Cricket Stadium in Panchkula on Friday. Wasim Jaffer’s unbeaten 192 steered India to a commanding 352 for three at stumps on the first day of the second Test against Pakistan today. Opener Jaffer was part of two century partnerships which laid the foundation for an imposing total after the hosts chose to bat on a benign Eden Gardens pitch. The first day of the second Test match between India and Pakistan was totally and comprehensively dominated by India. It was a pleasure to watch Jaffer, Dravid and Tendulkar execute a well thought out plan. Brian Charles Lara. The very name spells magic. The former West Indian skipper and among the leading contemporary batsmen, the left-handed swashbuckler has innumerable magical innings to his credit. Former all-rounders Craig Macmillan of New Zealand and South Africa’s Lance Klusener would be the star attractions when Kolkata Tigers will take on Chennai Super Stars in the second match of ICL Twenty20 League in a day match tomorrow at Tau Devi Lal Cricket Stadium, Sector 3, here. The Netherlands continued their blistering pace with a classy 3-1 win over hosts Malaysia at the Champions Trophy here today. Krishnan Sasikiran blitzed Vadim Zvjaginsev of Russia in the second round of World Cup of chess in Khanty Mansisyk in Russia. Defending champion Jeev Milkha Singh kept India’s hopes alive on the par-72 greens of the Tokyo Yomiyuri Country Club in Japan today. Namdhari XI downed South Central Railway 4-2 to sail into the semifinal of the 18th Lal Bahadur Shastri Hockey Tournament at the Shivaji Stadium here today. The Indian Cricket League (ICL), Zee Entertainment head Subhash Chandra’s rebellious newborn was finally on its feet this evening. To see the BCCI’s potential challenger roll with its first Twenty-20 tournament at Tau Devi Lal Cricket Stadium here was a packed house, a battery of political bigwigs and stunner Kareena Kapoor. For Chandra, who was seen personally checking on his VVIP guests, the moment could not have gotten better. Kareena Kapoor on stage with her troupe at the opening of the Indian Cricket League carnival in Panchkula on Friday. It was his birthday today and he got his perfect gift, as the ICL took a flying start, with Kareena Kapoor, union railway minister Lalu Prasad Yadav and Samajwadi Party general secretary Amar Singh joining in the celebrations of two birthdays — Chandra’s and ICL’s. Interesting it was to see that the same stage was shared by Kareena, TV stars and political high-ups; each one staging their own brilliant performance, much to the cheer of audiences. While Kareena took the lead by dancing on a medley of her chartbusters, Lalu Yadav followed in his trademark style: “We have nothing against the BCCI. We are here to lend support to this huge effort to represent regional cricketing talent. We are amazed at the turnout. It looks like stars have descended on the ground for ICL,” said Yadav, firmly patting the backs Chandra, Kapil Dev and Kiran More, all present today. He turned out as usual the perfect entertainer, holding the crowds with his smart one-liners. His sort of political speech from the ICL stage ended with a winner - “Jai Hind”. The crowds naturally enjoyed the show of political strength at a sporting event that became even more entertaining with the day’s descent. Mutterings apart, the evening offered a heady mix of sport, entertainment and politics. 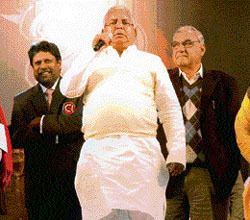 While the performers, except Kareena, were far and few, politicians turned out in big numbers to help ICL flex muscle. Present also were Jai Prakash Yadav, union minister of state and Naresh Agarwal, SP legislator. And then there was Haryana’s big man CM Bhupinder Singh Hooda to lend support; he was the last among politicians to arrive. The first celebrity to enter the stadium today was Kareena, who was followed by ICL think-tank including Kapil Dev, and then Laloo and Amar Singh, who came straight from Delhi after attending the parliament session. Amar Singh was in a good mood and chose to compare Chandra with Kerry Packer, the pioneer of one-day tradition. His final statement was about the BCCI: “BCCI, as a senior organization, must encourage competition. But we are not here to criticize anyone; we are here only to encourage ICL,” Singh said. More so because the teams had among their ranks big hitting stars like Chris Cairns, Andrew Hall and Hamish Marshall. But it did not turn out to that way as Chandigarh Lions defeated Delhi Jets by nine runs in a low-scoring match at Tau Devi Lal Stadium at Panchkula today. Chandigarh Lions, after being put in, put 134 on the board in the stipulated 20 overs before being all out. Chasing this modest total, Delhi Jets batsmen came a cropper and could score 126 for 6 in their allotted overs, falling short by eight runs. Batting first, Lions’ innings never really got going. Things initially started to look positive for them when opener Imran Farhat played a couple of bold strokes and Hamish Marshall looked like following suit. But failure of the batsmen to stay at the wicket thwarted the innings from gaining momentum. Arrival of skipper Chris Cairns pepped up the proceedings. Wasting no time and hitting two towering sixes and as many fours, the former Kiwi all rounder, known for his power-packed hitting, promised entertainment. But the belligerence proved short-lived as the arrival of left-arm spinner Ali Murtaza dramatically changed the scenario. His twin blows castling Cairns and then evicting Chetan Sharma meant Lions were put on the back foot again. Wickets kept on tumbling at one end, while Hall continued to add runs to the total. Ultimately, the burly South African all rounder was left stranded at one end as wickets kept on falling at the other end as the side was bowled for 134 runs in 20 overs. Hall remained unbeaten on 31, the highest score from the side. Chasing this total, Delhi Jets lost Taufeeq Umar early. Skipper Marvan Atapattu and opener Monish Mishra steadied the innings, but for a short while. Former New Zealand seamer Daryl Tuffey dealt crucial blows to leave the innings in complete disarray. Fireworks by J.P. Mishra and Abbas Ali later in the innings raised visions of a victory. Ali was a revelation and hit three gorgeous sixes notching up 18-ball 30, while Yadav supported him well with 18-ball 21. But they ran out of overs as Chandigarh Lions emerged winners by eight runs. Tuffey, who took three wickets at the crucial moment of the innings, was adjudged Man of the Match. Bowling: AJ Hall 4-0-26-2 DR Tuffey 4-0-16-3 A Uniyal 3-0-20-1 TP Singh 4-0-25-0 Rajesh Sharma 4-0-33-0 RS Sodhi 1-0-5-0. Wasim Jaffer’s unbeaten 192 steered India to a commanding 352 for three at stumps on the first day of the second Test against Pakistan today. Opener Jaffer was part of two century partnerships which laid the foundation for an imposing total after the hosts chose to bat on a benign Eden Gardens pitch. The stylish 29-year-old flayed 32 boundaries for a fifth Test century — his first against Pakistan — as he dominated a weak bowling attack. Shoaib Akhtar, who had cleared a fitness test in the morning, bowled just nine overs in four spells. Younis Khan led the side in the absence of captain Shoaib Malik, who was ruled out with an ankle injury. Paceman Mohammad Sami passed a late fitness test. The tall and correct Jaffer shared a 136-run stand for the second wicket with Rahul Dravid (50) after Dinesh Karthik fell early. 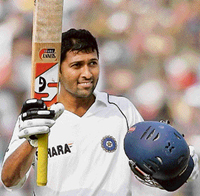 Jaffer, playing in his 24th Test, then put on 175 for the third wicket with state team mate Sachin Tendulkar, who reached 1,000 runs against Pakistan during his breezy 82. Left-armer Tanvir struck with his first delivery when he had a tentative Karthik edge to stand-in skipper Younis Khan at second slip for one. But Pakistan, trailing 1-0 in the three-match series, had to wait until an hour after lunch for their next wicket. In-form Jaffer reached his century off 150 balls with a fine cover drive off Danish Kaneria after Dravid was unluckily given caught behind to the leg spinner in his second spell. Jaffer, who faced 255 balls, was particularly severe on the erratic Tanvir, playing in his second Test, whom he hit for four boundaries in a single over to reach his 50. He lashed the left-armer for 18 boundaries. Jaffer drove fluently on either side of the wicket and raced towards a double century when fading light stopped play. Sourav Ganguly was unbeaten on 17. Fall of wickets: 1-2, 2-138, 3-313. The first day of the second Test match between India and Pakistan was totally and comprehensively dominated by India. It was a pleasure to watch Jaffer, Dravid and Tendulkar execute a well thought out plan. Let me also place the defence for the Pakistan side: few key players were down with injuries, they were playing with a half-fit Shoaib and they had lost the toss. However, if you are a Test playing nation of the stature of Pakistan, you just do not depend on your playing eleven. Your bench should be more eager and hungry to perform and you do not play half-fit players even if they are your star players. To be honest, I have rarely felt so bad while watching cricket as I did on the first day of the Kolkata Test. I can only say that this Pakistan team cannot play any worse than this — even if they tried. In the past even if we had a lacklustre team — in fact, there were a few of those against India, mind you —we fought every inch of the way. It was always “do or die” in the field. This time it seems a case of “die or surrender”! Rarely can an international team have been so much at sea so early on in a Test match. Just a few days ago, we saw a very different side in Delhi. At the Kotla, Pakistan at least fought and were in the match for the first three days. It was a different team then. Here, they appeared to have surrendered the initiative from the very first ball. It is understandable that if a team has so many players down with some ailment or the other, like Pakistan has at present, it is difficult to put a playing unit on the field. But having gone into the match, there should have been some sort of a contest, a spirit of trying, a desire to show the opposition that despite the unavoidable injury and illness setbacks, Pakistan would fight. Sadly, none of that was apparent. Having said that, let me also make this point that a big difference between these two teams is fitness. India have played more Test and ODI cricket than Pakistan, and yet are a much fitter side. On the other hand, even though Pakistan have played much less recently, they are unable to field an able unit. We are witnessing a result of that difference. But back to the match. To start with, playing Shoaib Akhtar was a huge mistake. Obviously, the idea was to gamble on winning the toss and batting first to give him some extra rest. But then my question to that approach is, what is the guarantee they you would have lasted for even the day batting first? Shoaib looked tired from the very first ball he bowled and it came as no surprise to me that he could only manage nine overs through the day. You simply cannot play someone who is half-fit. Shoaib was suffering from bronchitis and recovery from something like that is never easy or quick. Knowing this, Pakistan should have gone in with another spinner. Instead, we had Sohail Tanvir bowling left-arm spin. And mind you, he opened the bowling with Shoaib! That about sums up the state of this side. The ICL organisers will be expecting the likes of Lara and the burly Inzaman to come good and display the artistry they are known for when Mumbai Champs take the field against Hyderabad Heroes at the Tau Devi Lal Stadium at Panchkula, near here, in the evening tomorrow. No sight on a cricket field can be better than witnessing master batsmen like Lara and Inzamam in full flow doing what they have been doing with amazing regularity. A lot will be expected from the “flawed genius” Lara, Inzamam and a battery of other international and domestic stars so that the tournament gets off to a rollicking start. The contest, in fact, provides cricket buffs a golden opportunity to have a glimpse of their favourites stars and some of the most talented domestic players in action. For Mumbai Champs, along with Lara, the presence of hard-hitting New Zealand opener Nathan Astle, Johan Van der Wath of South Africa and Worcestershire skipper and former England middle order batsman Vikram Solanki should make the contest exciting. All rounders like Robin Morris and Shreyas Khanolkar, Anupam Saklecha, Kiran Powar and Rakesh Patel, all well known players in the domestic circuit, will be equally eager to make their mark as well as try to learn the tricks of the trade while playing along with the biggest names in the game. Talentwise, Hyderabad Heroes look like on level terms with their rivals. While skipper Inzamam-ul Haq is in his groove, having announced his retirement from Test cricket during the second Test at Lahore in the previous series against South Africa. A veteran of 120 Tests and 378 ODIs, Inzamam, known for his ferocious cuts and pulls, has the impeccable credentials to galvanise his team into an exciting unit. The presence of peerless all rounders like Abdul Razzak and Azhar Mahmood (both Pakistan) and Chris Harris (New Zealand) and Nicky Boje (South Africa) should be motivation enough for the fans to rush to the stadium to see them in action. Ambati Rayudu, Anirudh Singh, Ibrahim Khaleel and Alfred Absolem are among the domestic players who are likely to add spark to the proceedings. A cracker of a contest under flood-lights is on the cards when the two teams start rivalry on the morrow. Teams: Mumbai Champs: Brian Lara (captain), Vikram Solanki, Robin Morris, Nathan Astle, Kiran Powar, Shreyas Khanolkar, Johan Van der Wath, Rakesh Patel, Avinash Yadav, Nantie Hayward, Subhojit Paul, Dheeraj Jadhav, A. Sanklecha, Ranjeet Kirid, Pushkaraj Joshi, Suyash Burkul, Raviraj Patil, Nikhil Mandale, Sridher Iyer. Hyderabad Heroes: Inzamam-ul-Haq (captain), Chris Harris, Nicky Boje, Abdul Razzaq, Azhar Mahmood, Anirudh Singh, Ambati Rayudu, S. Shahubuddin, Stuart Binny, I.S. Reddy, Vinay Kumar, Ibrahim Khaleel, Kaushik Reddy, Bheema Rao, Alfred Absolem, Shashank Nag, P.S. 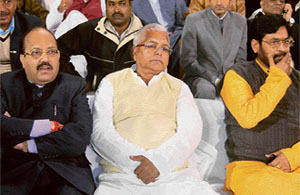 Niranjan, Baburao Yadav, Zakaria Zuffri. With these pinch hitters being part of the match, a lot of fireworks are expected in tomorrow’s match, which will start at 12.30 pm. Klusener, who has 5,751 runs and 192 wickets in one-day international matches, will be trump card for the team, led by the skipper Craig, who also has an impressive record with 4,707 runs in ODIs. On the other side, Sri Lankan all rounder Russel Arnold and Australian import Ian Harvey and Stuart Law will be the main weapons. Definitely, the Tigers would have an upper hand in the match if one goes through the teams’ composition. Besides Craig and Klusener, England’s Darren Maddy, Abhishek Jhunjhunwala, Rohan Gavaskar and Deep Dasgupta will provide depth to the batting line. Pace bowlers Abu Naschim, Boyd Rankin of Ireland and Sayed Akhlakh Ahmed would add more sting to the bowling attack. Sri Lanka’s leg break spinner Upul Chandana, accompanied by Shiv Sagar Singh, will dodge the rival batsmen with their spin bowling. The Super Stars will be relying on their key players including skipper Stuart Law, Russel Arnold of Sri Lanka (both all-rounders), fast bowler Shabir Ahmed from Pakistan, Ian Harvey of Australia, England’s Chris Read and former Indian team member Hemang Badani. G. Vignesh, R. Jesuraj, Shabir Ahmed and Tamil Kumaran will be the other fast bowlers that the team has. Syed Mohammed is the spinner for the team. The better record of the players of the Kolkata team at the international arena just indicates the direction the match might go. Chennai’s skipper Stuart Law, who is just at the right side of the forties, has played only 54 ODIs with 1,237 runs while the other key players Ian Harvey has made only 715 runs in 73 ODIs at the international level. However, Russel Arnold has international experience of scoring 3,950 ODI runs and 40 wickets. The final 11 of both of the teams would be announced tomorrow morning. World champions Germany also picked up their second victory in the tournament when they soundly defeated Britain 4-0. The Netherlands, the defending champions, fell behind early in the match as Malaysia took a shock lead through Kelvinder Singh in the 18th minute. But the Dutch soon established control and in quick succession blasted replies through Taeke Taekema, Rob Reckers and Ronald Brouwer. After drawing both the classical games and then the Rapid games, Sasikiran won both the Blitz games to complete a 4-2 win. Sasikiran had to rely on wins in Blitz versions for the second successive round. In the first round, Sasikiran had beaten Sergei Zhiglako of Belarus in Blitz to advance. Sasikiran drew the first game and was then in trouble in the second game of Rapid tie-breaker. But Zvjaginsev blew that chance while being a pawn up and in a good position. Sasikiran held out for a draw and then in Blitz, he built up an early advantage and won the first game and did the same in the second to find a berth in the last 32. He fired a two-under par 68 to be tied second at the midway stage of the Golf Nippon Series JT Cup. Playing in similar cloudy conditions as yesterday, except that the wind was slightly mild, Jeev started with a birdie on the first. He repeated the birdie feats on the fourth and sixth to be three under. But then a difficult putt on the ninth saw him giving away a stroke to be two-under in the front nine. He bogeyed the 12th, but set things straight with a birdie on the 17th for a two-under card of 68 and a two-day aggregate of three-under par 137 to be tied second along with Prayad Marksaeng and Hirofumi Miyase. Harmeet Kahlon of Chandigarh moved up from tied 11th to tied seventh spot in the Johnnie Walker Cambodian Open today. He fired a three-under par 69 for the second successive day for a two-day tally of six-under 138 in the $3 lakh Asian Tour event on the par-72 greens of the Phokeethra Country Club in Siem Reap. Harmeet fired birdies on the first, second and fourth, but dropped bogeys on the seventh and eighth to be one-under par 35 in the front nine. He played a better back nine shooting birdies on the 11, 13th and 18th with a bogey on the 10th for three-under par card of 69. Arjun Singh slipped from fourth to sixth place returning a two-under card today for a two-day tally of seven-under 137. Another Chandigarh golfer Gurbaaz Mann played another par card today to be 144. Amandeep Johl played badly returning a three-over par 75 to slip to 56th spot at two-over 146. Gaganjeet Bhullar from Kapurthala fired a one-under par 71 for a two-day tally of 146 to make the cut. Namdharis, who led 2-0 at half time, scored through Gurvinder Singh, Gurcharan Singh, Tarunjit Singh and Balwinder Singh while K.K Bharat and I. Ming reduced the margin for Railways. Though Punjab National Bank (PNB) drew with Bharat Petroleum Corporation Ltd (BPCL) 3-3, they qualified for the last four stage. Yudhveer Singh put PNB in the lead and they held onto it well past half time. Irshad Ali equlised for BPCL, and then took the lead through Paramjit Singh. In other matches, Indian Airlines drew with Army XI 5-5 while Indian Oil beat Air India 1-0. Didar Singh scored the matchwinner for Indian Oil late in the second half.